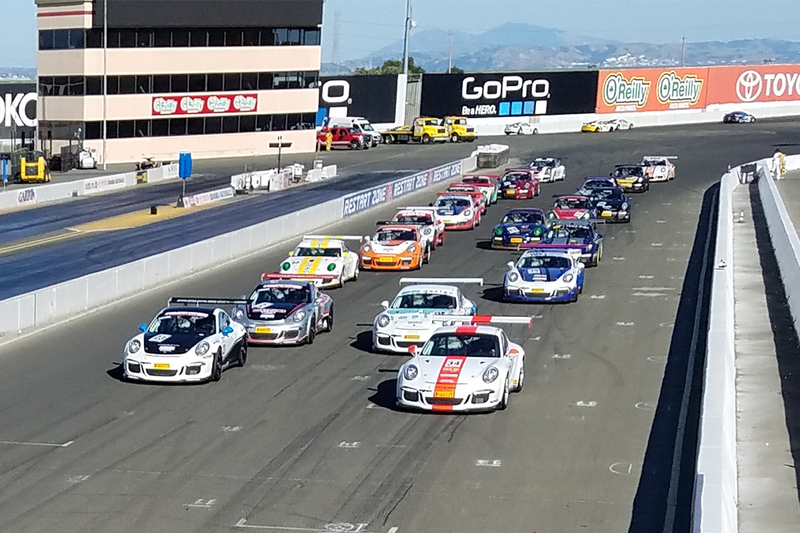 Sonoma, Calif. (20 May 2017) – Race three of the Pirelli GT3 Cup Trophy USA season provided intense, nonstop action at Sonoma Raceway Saturday in a 17-lap race that saw Dino Crescentini emerge with the victory. The green flag fell just after 6:00 p.m. local time at the picturesque, 2.52-mile Northern California road course. The early going saw pole sitter Crescentini, driving the No. 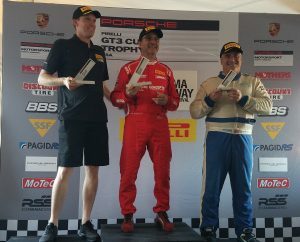 34 Crescentini Racing Porsche 911 GT3 Cup Car, extending his lead over Competition Motorsports’ Mark Nelson and 911 Design’s Loren Biggs. 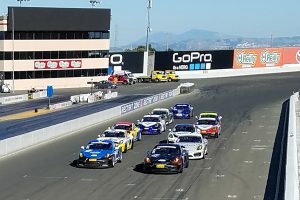 But the action was slowed on lap nine as three cars tangled in Turn 11 – Diamond Class driver Russell Ward, Diamond Masters pole sitter Michael Zuieback and Platinum class pole sitter John Krieg. With Ward in the tires and Krieg slowed in Turn 2 with a cut tire, the full course caution flew. The green flag came back out three laps later, with Nelson and Beggs closer to Crescentini but unable to make a charge. 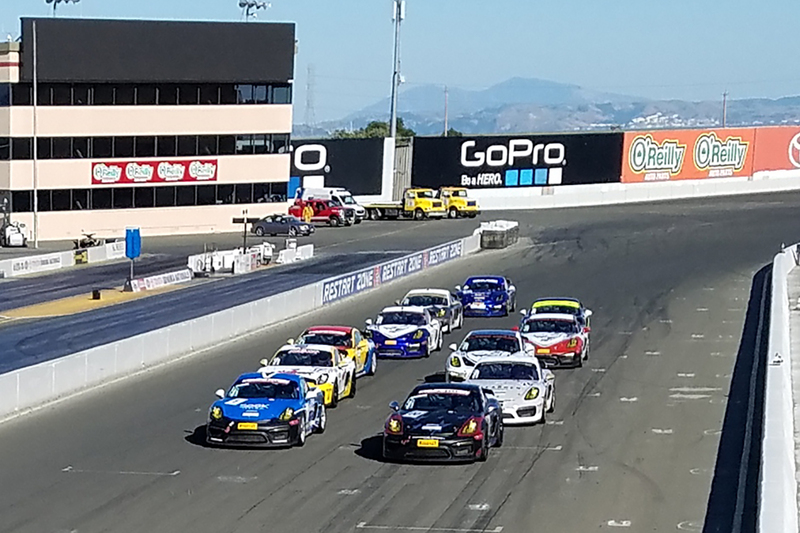 A sprint to the checkered flag was halted a few laps later after the Silver Class Porsche Cayman GT4 of Jim Slavik tangled with a slower car, damaging his wheel as the race was checkered shortly thereafter. With pole sitter Zuieback on the sidelines following the incident, it was up to Competition Motorsports Diamond Masters teammate Mike McAlister, who held off a charging Bryce Ward of Win Ward Racing and Will Lin from TruSpeed Autosport to take the victory. In the Platinum Class (for Porsche 911 997.2-version GT3 Cup Cars), Ray Shahi put the No. 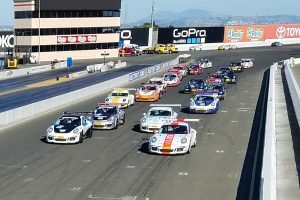 65 Sterling Collision/Newport Porsche TruSpeed Autosport entry into the lead after the incident that took pole sitter Krieg out of the race. Shahi held onto the lead ahead of teammate Larry Schnur and Ranson Webster. In the Silver class for Porsche Cayman GT4 Cup Cars, Rearden Racing’s Jeff Kearl got around Competition Motorsports Sean McAlister on lap 15 to take the lead – but not without some paint behind exchanged. The pair fought hard through several corners before Kearl made the pass stick. The pair fought hard through several corners with the lead passing back and forth before Kearl made the pass stick in Turn 3a on lap 16. With a focus on driver development, close competition and clean racing, series officials looked at multiple views of the incidents and assessed several time penalties following the race. The updated results saw GMG Racing’s Hutton McKenna classified as the race winner, with McAlister second and Kearl third. In the Silver Masters class, Competition Motorsports’ Steve Goldman started out front and held the point for his second win of the season over teammate Carl Tofflemire and Flying Lizard Motorsports’ Martin Brauns. The Pirelli GT3 Cup Trophy USA will return to the Sonoma Raceway for Race 2 on Sunday with the green flag set to fly at 2:15 p.m. PST. This entry was posted in News on May 20, 2017 by admin.